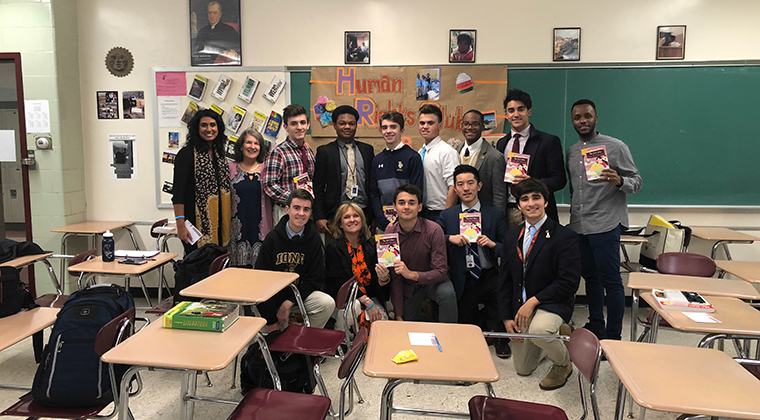 Student members of Iona Prep's Human Rights Club pose with guest speaker Sangita Bajulaiye, a Human Rights attorney and Ph.D candidate from the Netherlands (top left). Also pictured are Sangita's husband Omololu (Iona Prep class of 2007, top right), and Human Rights Club moderators Patricia Gray (second from left, top) and Christina Chana (second from left, below). Oftentimes in the news, we hear of atrocities being committed against minority and marginalized ethnic groups across the world. We see pictures and videos of thousands of refugees in camps, unable to go back to their homes because of persecution, violence and war. Unfortunately, that is often where the news-story ends, with little to no closure or future hope for justice for people so marginalized in our world. What happens to people who truly lose their country when they are forced out? This Fall, Iona Prep's Human Rights Club hosted a guest speaker, Sangita Bajulaiye, a Human Rights Attorney and member of the Institute on Statelessness and Inclusion (ISI). Sangita was visiting the United States to speak about Statelessness and shared her research, experience and stories with students from the Human Rights Club. Essentially, individuals or groups (such as the Rohinga people), when forced out of their country for various reasons, can lose citizenship in their own country, along with privileges that we often take for granted, such as the ability to get a birth or marriage certificate, a passport, open a bank account, vote, own property etc. Sangita's work has also included her contributions in ISI's publishing of a book, "The Girl Who Lost Her Country." This book provides information about Statelessness through the eyes of Neha, a Nepalese girl who lost her statehood. Sangita also spoke to Iona Prep's Lower School students and provided students with copies of the book so that they could learn more about Statelessness and how to advocate for those affected by it. Religious Brothers Day is May 1 - Join in celebrating the gifts and vocation of Religious Brothers on May 1, the 3rd annual Religious Brothers Day. In celebration of Religious Brothers Day, CMSM has launched a new website for and about brothers: ReligiousBrothers.org, where we can post events, news, and profiles that tell the story of Religious Brothers in the United States. We are pleased to announce the second National Religious Brothers Symposium will be held on April 4, 2020 at Boston College. Registration will open September 1, 2019. The day will focus on the prophetic call of the brother within the Church. Bro. Guy Consolmagno, SJ, Director of the Vatican Observatory, will offer the keynote. Other addresses and programming will be announced in the near future. The Edmund Rice Christian Brothers Art Foundation, LTD has been established to preserve and promote the very significant heritage of works of art produced by Brother artists in North American. Mindful of the treasured place of art in Catholic tradition and education, the Foundation, in collaboration with the Office of Educational Services, seeks to stimulate the art programs of our schools. On February 12, 2019 Brother Rice High School, Bloomfield Hills, MI joined together with Marian High School for our 13th Annual "Souper Bowl" Dinner to raise awareness for hunger issues in our community and money for the Capuchin Soup Kitchen and St. Leo's Soup Kitchen both in the city of Detroit. More than 400 people gathered together to feast on a simple dinner of soup, salad and bread that were donated by local restaurants and shops.